So a day where I woke up on the A380 and finished up on the Dornier 328, with an A320 sandwiched in between. And all the BA flying on this trip complete, just the Norwegian back to Gatwick tomorrow AM. The LHR->OSL leg was just a bit dull really. Manual safety demonstration, one must be thankful for small mercies I guess. On the other hand I'm really growing to love Sun Air. It's a great little airline, and the service is fantastic. Dinner today was a baguette style sandwich of chicken, bacon and curry mayonnaise, which shouldn't have worked, but it did. Served with a small bounty chocolate and the ubiquitous BA nuts. And with that a pre-meal drink, a Baileys or Cognac afterwards, and a tub of ice cream, all packed into a very short flight. And above all Majken. She was the flight attendant when I flew on the Jetstream 32 in November, in fact I had the same crew today, but honestly it's worth flying Sun Air on an Aalborg leg just to run into her. Boundless energy, full of slightly enigmatic smiles, and she sort of dances up and down the cabin. Really great. I'm a little bit smitten by Majken. I like Aalborg too. Very easy to get to and from the airport on the number 12 bus for 22 krone, and a nice vibe about the place. Back in the Cabinn hotel which I also like a lot. I may be getting mildly euphoric at the prospect of finishing a complex sequence of flights with no serious issues and generally good comfort. And getting close already to the half way point for GGL, before the expiry of last year's card. Energy levels are high, body clock fine (better be, I have to work tomorrow afternoon). Really enjoying the rides so far. PETER01, dylanks and TravelManBiz like this. Thanks for the updates bisonrav in your quest for CCR/GGL. I'm thoroughly enjoying reading your travels, taking things in your stride and may I say you are also adding some great travel tips, too many to list but for example the bus number as above etc. Great to have a whole empty row in 25 on the A380 there in your previous post! corporate-wage-slave, frandrake and Down the back like this. Having flown extensively with work over the years which does become a bit tiresome, I'm almost tempted by your adventures bisonrav to try something like the PHX mini-do to see if it puts the fun back into flying. Well done to you for documenting your quest so enthusiastically and entertainingly. Your thread makes for very enjoyable reading and it's the first one I read when there's an update. corporate-wage-slave and Down the back like this. Nice reading of your blog .... BUT seriously Bread Roll on the fold out table ?? Down the back likes this. 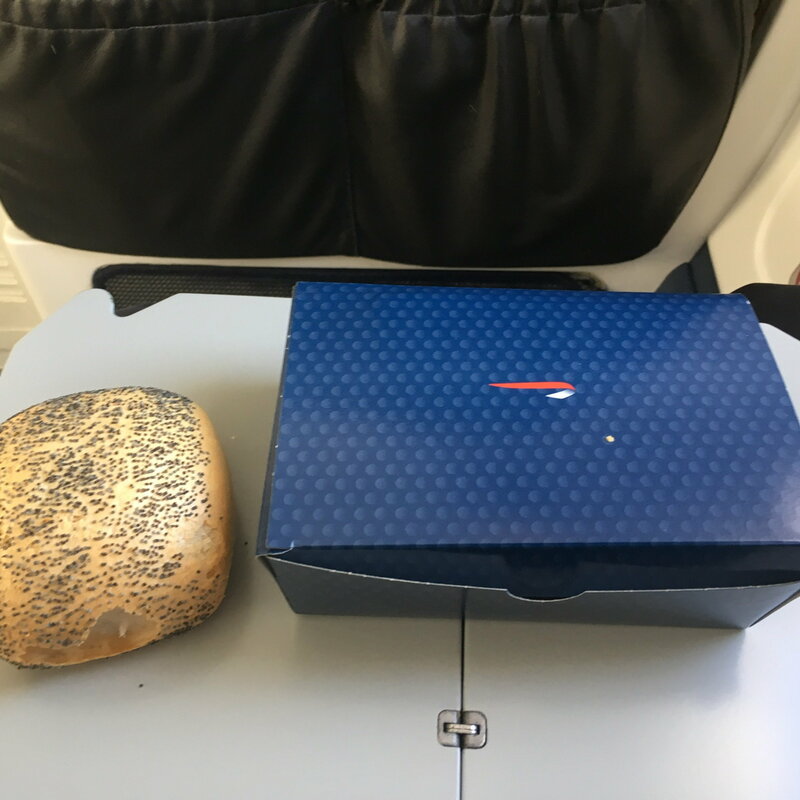 Please to not place your edible hats on the tray tables. Meanwhile the return flight to LGW from AAL was another excellent one from Norwegian. Not a very full flight, and so I made a beeline for 1C from my assigned 20C the instant the seatbelt light came out, cunningly using my coat in full German towel style to reserve it so I could go back for my bag. With all due deference to those who don't like BA bashing, and the Lufthansa thread, if I were flying SH for work and Norwegian were flying the route, I'd take them over any other airline on the evidence of the flights I've had with them. What swings it for me is the wifi - I was able to get a few work emails done and sort out a meeting or two (I'm working this afternoon), so it makes the flight very productive. Good crew, new aircraft, and just a very positive experience without any negatives I can think of. Not sure if I'd take them long haul, but we'll see. On the train home, BA called about a hotel booking in Madrid. I knew this was a bit dodgy because the prices had literally trebled between me booking flights and going to the Hilton site to book the hotel - this is for a trip in late May. BA had the original price so I booked there, sort of expecting a rejection, but it went through OK. Anyway it turns out there had been a large block booking at the Hilton so nothing available, so they've booked me into the Melia in a better room with breakfast, which I think is a decent result. Well done BA. I must admit although other airlines beat BA here and there on specific elements of the product, the BA travel experience has been consistently very good overall, particularly when I've needed assistance. And that's your lot for this trip. 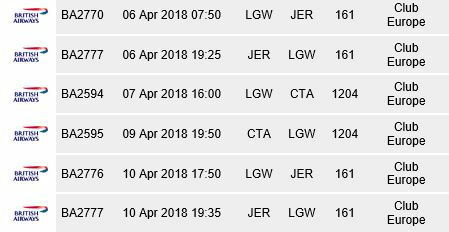 Next one (ex JER to Catania) starts on the 6th, then there's a rash of work SH with a side trip to Spain and it all calms down massively in May. Oh, and PS. I am now self-identifying as Vueling curious. dylanks, squawk and MrPrice16 like this. The upcoming itinerary for the next sequence. Fairly straightforward day in Jersey, followed by a couple of days in Catania in an Airbnb, then a B2B to Jersey. The only tricky bit is minimising holiday usage here. And finding something to do on Monday all day in Catania. And finding something to do on Monday all day in Catania. If you are feeling adventurous, visiting Mount Etna, though it isn't that easy to get around. Otherwise visit the fish market that Rick Stein said was one of the best in Europe. An early bus 50 miles, 90 minutes, £6, from Catania to Syracuse to embrace history and heritage and walk around its old part, Ortygia, with its maze of winding alleys and old buildings. In Catania, keep clear of the dodgy areas which are close to the main tourist section. corporate-wage-slave and bisonrav like this. Next sequence starts tomorrow, with a day trip to Jersey. As originally planned, I was doing this as a B2B to join onto an evening flight starting the Catania booking. But for some reason, the fare for the outbound flight I wanted went up between me booking Catania and going back for it, so I moved the booking onto the first flight from Gatwick in the morning. This means a full day in Jersey, and a tour of the local attractions, which seem to be roughly what they were in about 1972 when I first visited on a school trip. It's not going to be 1 star Michelin this time though, I'm going to be doing it on the cheap. Things have become a little more interesting as I have to work for a few hours during the day to clear a couple of deadlines. And I need somewhere with wifi and reasonable comfort - first choice was Starbucks, but there isn't one in Jersey as far as I know, so I think it's going to be McDonalds for the first conference call, and some local coffee shop afterwards, unless some friendly local has a corner of an office they can spare between about 10 and noon. In other news, I booked a little pleasure trip in early May to the Isle of Man to kill a brace of birds with one stone: firstly flying in and out of LCY which I've only done once at a time when I wasn't really paying attention, and secondly to have a go on a Saab 200. This is an RFS in Y, and literally out, lunch and back before teatime. I'll be looking for a few little side trips like this on top of the TP runs and work trips, to keep the fun in the flying so to speak. As well as the Junkers 52 flight in August from HAJ, BRR is possibly also on the agenda. The thing I found interesting about the RFS here was that essentially I've more than earned the Avios needed by doing online surveys in front of the TV. Very good value, RFS. And (oh the shame of it!) I took a very poor value POUG for a work trip to Milan next week. I had a perfectly good exit row seat, but got a decent bonus for work, felt a bit flush, and thought I'd sit myself in 1C. I've got a couple of late flights 12/13th and that swung it more than anything else, it's a murderous schedule. rockflyertalk, TravelManBiz and Traveller 935 like this. A very pleasant day in Jersey. Quite an early start and breakfast in GF in the South Terminal, an utterly uneventful flight over, though I was amazed to see the crew got a full breakfast service out in the 40 minute flight, I was expecting maybe a couple of slices of melon and a yoghurt. Anyway I declined that but got through one third of the tea quote C-W-S allows himself on short duration flights. However one thing I did remark on, and may even complain about, was the absolutely disgusting state of the toilets. I took some photos which aren't for the faint hearted, but they were stained, residue in the corners of the cubicle and elsewhere, and given it was the first flight of the day and I was the first in completely unacceptable. I'm genuinely unconcerned by grime generally, but this was really beyond the pale. One other lounge observation was that whoever sets the BA wifi passwords probably reads FT and has a sense of humour. Then the No 15 bus to town (£2, 30 minutes, nice views), and the hunt for somewhere to have a conference call. I settled on a corner of the bus station, and everything worked out OK. If you were waiting for a bus and wondering why someone was discussing data integrity in the Pharma industry, it was because he hadn't actually admitted he had gone to Jersey and "working from home" is a broad church. Following that I set up shop in the Costa round the corner on the free wifi and got the working half day done. Part of that was setting up a possible trip in early May to Vilnius via Helsinki - my colleagues are starting to invite me on trips specifically for enhanced lounge access. Then the bistro opposite for a local crab linguine which was excellent, and a glass of prosecco to wash it down. One of the unfortunate side effects of this year is to change an antipathy to fizz into a slight yen for it. I had quite a lot of possible plans - German military hospital, maybe a hop over to Guernsey, but the timing of transport didn't really work out, so I settled for a walk around town punctuated by sitting in the sun, plus an ice cream. They have pound notes here, which is cute but confusing - I tried to buy my ice cream with one of them thinking it was a fiver, and there was one of those uncomfortable pauses before I figured out why he wouldn't let go of the cone. Jersey has a lovely retro feel, a bit like Dorset before prog rock arrived a couple of years ago, or the 1950s but with better restaurants. I was chatting with a friend on Whatsapp, and explained to her I was enjoying myself, and that there was obviously a lot of money in Jersey, speculating tongue in cheek that it was entirely due to Bergerac royalties. And then discovered to my great amusement that there is a Bergerac exhibition in the museum, and that John Nettles' books are all over the place. Chatting to a local I discovered that a vast amount of money had recently been rather controversially spent on the police headquarters in St Helier, seemingly on the basis of a local murder rate that is almost entirely fictional. God only knows what they're spending in Midsomer. Now in the lounge at the airport. Even after just a couple of visits, I think a lot will be lost with the redevelopment. It's a lovely compact airport with a lot of character, and I've figured out a lot of contingencies for B2B in case there's an officious official. The arrivals exits via the "old" terminal at the moment which is a lovely old building. Quite a while to the return flight, then home and off again tomorrow afternoon to Catania, where the weather looks sublime. Doubtful there will be a hot meal on the way home, but still rather stuffed from the linguine. joelyp, dylanks, corporate-wage-slave and 4 others like this.